J. S. African Bot. 11: 1 1945. Origin and Habitat: Encephalartos eugene-maraisii occurs in an isolated mountainous area in the Waterberg range in the Limpopo Province, South Africa (ex Transvaal). Estimated area of occupancy 50 km2. There are small scattered subpopulations (Number of mature individuals in the wild 982-1200). Altitude range: 1,400 to 1,500 metres above sea level. Habitat and Ecology: This species grows on sandstone hills and rocky ridges of the Waterberg range. It grow in open grassland and savanna. The plants experience very cold winters and the rainfall is around 600 to 750 mm per annum and falls predominantly in summer. At the time of pollination, a boring beetle (Apinotropis verdoornae) associated only with the Encephalartos eugene-maraisii swarm about the cones of this cycad, the beetles lay eggs, form larvae, and pupate within male cones, emerging as adults by boring through the the microsporophylls, covered with pollen. This may be one of the way in which the female cones were pollinated. Encephalartos eugene-maraisii also use smells and heat to attract and repel insect pollinators. The plants heat up and produce a strong odour that drives the pollen-covered insects out of the cones of male plants. The female cones then attract these same insects with a milder, more alluring odour. When the insects move between the sexes, they inadvertently transfer the pollen from the male cones to the receptive ovules of the female cones. E. eugene-maraisii is threatened due to over-collecting for ornamental purposes and this could lead to reproductive failure. Although recent surveys show relatively little illegal collecting, farm managers still feel that collecting is taking place. Description: Encephalartos eugene-maraisii is a robust cycad remarkable in its size and formation, with trunks up to 4 metres tall, unbranched or more often branched from base, occasionally procumbent (lying along the ground) when long. The young fronds are a beautiful silver-blue colour. It is distinguished within the group of blue-leaved species of northern South Africa by its leaflets with small or absent teeth. Encephalartos eugene-maraisii is among the rarest of the blue cycads from South Africa. Derivation of specific name: The specific name honors the Afrikaans naturalist who first discovered this cycad, Eugene Marais, poet and writer, uncle of the South African botanist Inez Verdoorn. In 1926, during a six-month trip into the interior of the Waterberg, Eugene Marais discovered this unusual cycad near Entabeni and sent a specimen to the botanist, Dr Rudolf Marloth, who, believing that cycads occurred only in the eastern parts of the country, relabeled the specimen as originating from Nelspruit. This was not too surprising as, even today, the closest relative of this giant plant grows several hundred miles away in the sandstone krantzes of the Karoo. Marais died before any scientific endeavour was made to locate the plants, and it was his niece, Dr. Inez Verdoorn, a noted botanist, who discovered that his specimen had been wrongly labelled and launched a renewed hunt for the tree. Upon discovering it, she named it Encephalartos eugene-maraisii after her uncle. Stems (trunks): 2.5-4 m tall (seldom exceeding 2,5 m when upright and if taller, the plants are usually procumben) and 30-45 cm in diameter with tomentose and small regular leafbases. Leaves: Spreading, rigid, light bluish green and held almost horizontally to the crown, 0.7-1.5 m long including petiole 16-20 cm long. Rachis nearly straight but the top third of the leafstalk curves slightly or markedly upwards, glabrous except for densely tomentose pulvinus mainly hidden by bracts, glaucous when young. Leaflets leathery and without nodules, glabrous, glaucous when young. Median leaflets linear-oblong, 15-20 cm long, 1.3-1.5 cm broad, cuneate at base, shortly pungent. The margins are usually entire but may have one tooth on the lower margin. The leaflets are reduced in size to no more than one prickle, leaving the lower 15 cm of the leafstalk bare to the base. Cataphylls (scale leaves): The cataphylls (Modified leaf, much reduced and thickened, serving to protect the apical meristem in cycads produced in flushes preceding the emergence of cones or leaves.) are soft and whitish. Phenology: Male and female plants produce cones in December which are greeny-grey overlaid with a dense layer of dark brown hair giving a generally dark brown-red appearance. Male cones: 1-3(-8) together on short stout peduncles, subcylindric, 22-42 cm long 6-8 cm broad, to the cones and have an unpleasant odour when mature. Female cones: 1-3(-6) per season per stem on short stout peduncles, ovoid to ob­long-ovoid in outline, 30-50 cm long, 16-20 cm broad. The female cones of Encephalartos eugene-maraisii do not disintegrate spontaneously, but dry out from May to August. Seeds: Amber to light brown or sometimes slightly tinged with red, fleshy, angled by compression, 3.5-4.4 cm long, 2.3-3 cm in diameter. Related species: Encephalartos eugene-maraisii is part of a group of similar species that share a conspicuously glaucous foliage, but it is distinguished from the others by its straight leaves that recurve at their ends, spineless median leaflets, clear petiole, and green cones with a fine brown wool.. All them occur on the northern escarpment of South Africa, mostly at relatively cool and high elevations. The group comprises the nominate species, Encephalartos middelburgensis, Encephalartos nubimontanus, Encephalartos cupidus and Encephalartos dyerianus (all with similar female cones) and Encephalartos dolomiticus (with quite different female cones) and the poorly described still virtually unknown Encephalartos hirsutus. E. eugene-maraisii is also closely related to the Eastern Cape species Encephalartos lehmannii which it resembles, but it is a taller and more robust plant (E. lehmannii seldom exceeds 1,5 metres in height). Moreover Encephalartos eugene-maraisii lacks the distinct 'collar' at the base of the leafstalk which is prominent and distinct in E. lehmannii. Notes: The Encephalartos belong to an ancient group of plants known as the gymnosperms, which were among the first plants to inhabit the earth, and formed the staple food of herbivorous dinosaurs. 2) Gray, S. “Soul-brother Eugène N. Marais: Some notes towards a re-edit of his works.” Tydskrif vir letterkunde, 50(2), 62-80. 2013. 3) Dr J.P. Roux “Flora of Southern Africa” 2003. 6) Donaldson, J.S. 2010. Encephalartos eugene-maraisii. The IUCN Red List of Threatened Species 2010: e.T41904A10587250. http://dx.doi.org/10.2305/IUCN.UK.2010-3.RLTS.T41904A10587250.en . Downloaded on 13 October 2015. 8) Barkhuizen, B.P. “The cycad garden of UNISA”. UNISA Press, Pretoria.1975. 9) Grobbelaar, N. “Cycads of Southern Africa”. Published by author, Pretoria. 2002. 10) Jones, D.L. “Cycads of the world: Ancient plants in today's landscape”. Reed, New South Wales.1993. 11) Raimondo, D., Von Staden, L., Foden, W., Victor, J.E., Helme, N.A., Turner, R.C., Kamundi, D.A. & Manyama, P.A. (eds). “Red List of South African plants 2009”. Strelitzia 25. South African National Biodiversity Institute, Pretoria. 2009. 12) William Khutso Sepheka, Pretoria National Herbarium, July 2013 "Encephalartos eugene-maraisii” SANBI - South African National Biodiversity Institute, South Africa. <http://www.plantzafrica.com> ownloaded on 12 October 2015. 13) Whitelock, Loran M., “The Cycads”, Timber press, 2002. 14) Haynes J.L, “World List of Cycads: A Historical Review”, IUCN/SSC Cycad Specialist Group, 2011. 15) Wikipedia contributors. "Encephalartos eugene-maraisii." Wikipedia, The Free Encyclopedia. Wikipedia, The Free Encyclopedia, 6 Sep. 2015. Web. 13 Oct. 2015. 16) Ken Hill: "Encephalartos eugene-maraisii." – In The Cycad Pages. <http://plantnet.rbgsyd.nsw.gov.au/PlantNet/cycad/> Downloaded on 13 Oct. 2015. Cultivation and Propagation: Encephalartos eugene-maraisii is an adaptable plant well suited to warm temperate and subtropical climates. It is a very frost-hardy species. With its bright foliage heightened by full sun is a commanding accent plant in the general landscape and makes an excellent tubbed specimen. It can be grown in full sun without its leaves burning. Its colour makes it a good subject for the nightscape. Its beauty and ease of horticulture make it one of the finest cycads for use in the garden. It is partially drought tolerant, salt tolerant, and completely wind tolerant. 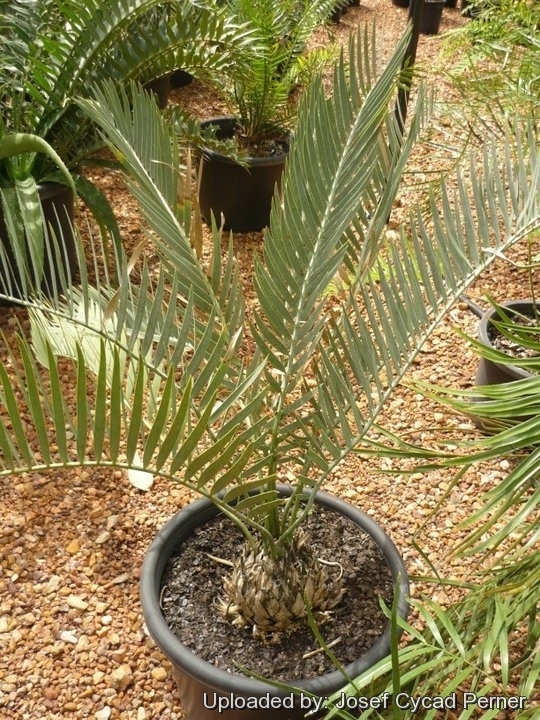 As a garden plant, this cycad will usually hold one or two crowns of leaves, all in good condition. As a seedling, it often loses its previous year's leaves before the new leaves emerge. The seedlings need plenty of room for the tap root to develop and require very good drainage. Hardiness: They do best in a tropical or sub-tropical or mild temperate climate and should be kept totally dry in winter at or around 10°C but demonstrate a remarkable degree of cold resistance and may tolerate frost especially if dry, however heavy frosts should beavoided. Propagation: It is easily propagated from seeds and suckers (the young plants that grow around the main stem). Seedlings at the one-leaf stage are susceptible to the fungal disease “damping off” which kills the seedling's single leaf at ground level. Warnings: Seeds have caused poisoning in humans.